Founder of the temple institute and rabbi Yisrael Ariel have called upon MKs and Israeli police to organize systematic and weekly break-ins at the Aqsa Mosque compound, especially the Dome of the Rock Mosque. Ariel confirmed that these break-ins aim to check on what he labeled as acts of sabotage (restoration works) being made by the Islamic Waqf authority at the Dome of the Rock Mosque. He also called on Jews to carry out similar break-ins on a daily basis into the Dome of the in order to impose Israel's sovereignty over the Dome of the Rock. 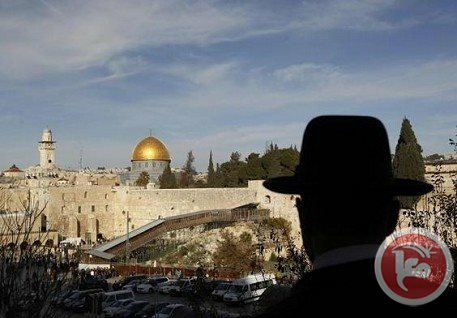 Ariel's calls came in support of Rabbi Moshe Tzuriel's statement in which he called for breaking into the Dome of the Rock and to expel Muslims from the holy site, according to his claims. For their part, temple mount groups have supported Ariel's statement and called to intensify Jewish break-ins into the Dome of the Rock in coordination with Ariel or other senior rabbis. In a related context, temple groups have organized a march on Thursday evening known as "the March of Doors" in order to celebrate March month in the Hebrew Year which is linked to their alleged Temple. The march started from Buraq Square along with Al-Aqsa Mosque gates amid Talmudic chants and slogans calling for accelerating the building of the alleged temple on the ruins of the Aqsa Mosque. Israeli settlers, on Wednesday, uprooted around 25 olive trees in the village of Madama, south of Nablus, according to a local activist. Ghassan Daghlas, who monitors settlement activities in the north of the West Bank, told the Palestinian News & Info Agency (WAFA) that settlers from the illegal Israeli settlement of Yitzhar uprooted around 25 trees belonging to one of the village residents. Israeli settlers Wednesday uprooted around 25 olive trees in the village of Madama, south of Nablus, according to a local activist. Ghassan Daghlas, who monitors settlement activities in the north of the West Bank, told WAFA that settlers from the illegal Israeli settlement of Yitzhar uprooted around 25 trees belonging to one of the village residents. Israeli Haaretz daily newspaper uncovered on Tuesday a new settlement plan of establishing a new settlement in the occupied city of Jaffa as part of significant efforts for Judaizing the city. The newspaper reported that the plan aims to build 12 housing units in" Bevet street", confirming that a settler group, that led by extremist "Yaakov Haimen, is responsible for the plan. The group stated that it will encourage the Zionist settlers to live in the new planned neighborhood. The first stage of the plan will include 12 homes built in Bevet street. The leader of the project Haimen, who lives in the occupied Jerusalem after leaving the colonial settlement of Itamar, always encourages colonial judaizing projects in the occupied Palestinian territories. A Palestinian young man, from Beit Ummar in al-Khalil, was seriously injured as a bus carrying Israeli settlers ran over him near the entrance to the town. Youssef Abu Maria, the coordinator of the village’s popular anti-settlement committee, confirmed that the 20- year-old Mouni Alqam was transferred in critical condition to a hospital in the Green Line. Abu Maria told Quds Press that the bypass road between Jerusalem and al-Khalil has recently witnessed a number of hit-and-run incidents targeting Palestinians under the security pretext that Palestinians pose dangers to passing Israeli vehicles! A group of Israeli settlers on Sunday attacked two Palestinian children in Hebron's Shuhada Street in front of Israeli soldiers, who did nothing to stop the attack, a local group said. A local group known as Youth Against Settlements told Ma'an that 13-year-old Ahmad Hisham al-Azzah and Yazan Zeidan Sharabati were assaulted by a group of settlers in the southern West Bank city while the two were walking to their homes in the Tel Rumeida neighborhood. 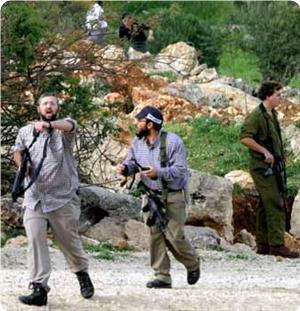 The group later published a video showing the settlers attacking the Palestinian minors while soldiers looked on. 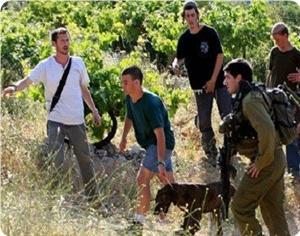 defend the teenagers, Israeli soldiers intervened -- on the side of the settlers. The soldiers then detained Yazan Sharabati and his father, Zeidan, accusing them of attacking Israeli soldiers. 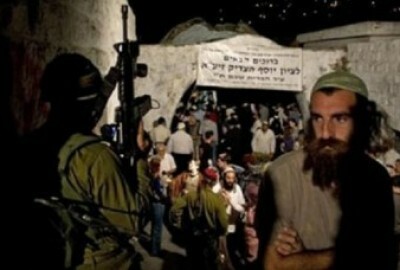 The settlers, meanwhile, are not stopped by the Israeli soldiers. The detained father and son were subsequently taken to a police station in the illegal Israeli settlement of Kiryat Arba east of Hebron. An Israeli army spokeswoman said that the pair had been detained for "hurling rock at soldiers" and had been taken for questioning. They were released a few hours later after the Palestinian military liaison department and a lawyer representing Youth Against Settlements intervened. Settlers and Israeli forces regularly target local Palestinians for harassment, and many have been forced from their homes as a result. A number of Palestinians were treated for breathing difficulty while a young man was hit with a bullet in his foot in confrontations in Beit Furik town, east of Nablus, on Monday. Eyewitnesses told the PIC reporter that the confrontation erupted after Jewish settlers attacked the eastern suburbs of the village and assaulted citizens’ property and houses under protection of Israeli occupation forces (IOF). The sources said that the soldiers fired teargas and live bullets at the villagers injuring Mohammed Hanani in his foot while others suffered from breathing problems. Jewish settlers have been targeting Beit Furik for the past few days under IOF protection triggering violent clashes with inhabitants. A number of extremist Israeli settlers invaded a Palestinian land that belongs to a resident of the Wad Rahhal village, south of Bethlehem, and uprooted it, the Palestine TV has reported. Hasan Breijiyyah, coordinator of the Popular Committee against the Wall and Settlements in the Bethlehem district, said that around 15 extremist settlers invaded the farmland of resident Ahmad Ayyash in Khallit An-Nahla area, and uprooted dozens of trees. Breijiyyah added that the land in question is around 700 Dunams (172.97 Acres), and was repeatedly attacked by extremist settlers who aim at installing an illegitimate settlement outpost. On Saturday evening, a number of Palestinians were injured when a number of Israeli extremists threw stones at them, and their cars, in occupied East Jerusalem. Extremist settler groups are responsible for thousands of attacks against the Palestinians, their lands and property, and even against the Islamic and Christian holy sites and graveyards. The attacks include writing racist graffiti, smashing tombstones, burning and defeacing holy sites, burning orchards, farmlands, in addition to burning cars, slashing their tires and numerous physical attacks against the Palestinians, including children and elderly. Israeli soldiers invaded various Palestinian communities in the occupied West Bank, conducted military searches of homes and property, and kidnapped three Palestinians. Local sources in Bethlehem have reported that the soldiers invaded a bakery in the Aida refugee camp, in Bethlehem, and searched it. The soldiers kidnapped Ahmad Ma’moun, who works at the bakery, after breaking into his home and searching it. Another resident was also kidnapped from his home in the Al-Obeydiyya town, near Bethlehem, and was taken to an unknown destination. Furthermore, dozens of soldiers invaded the As-Samoa’ town, south of the southern West Bank city of Hebron, broke into homes and searched them, and kidnapped one Palestinian. Local sources said that the soldiers broke into the home of resident Odah Al-Mahareeq, 31, and kidnapped him. Also in Hebron, soldiers invaded Yatta town, south of the city, invaded several homes and searched them before handing a number of Palestinians military orders to head to a nearby military base for interrogation. Furthermore, an Israeli military jeep installed a roadblock on a bypass road close to the Al-Fawwar refugee camp, south of Hebron, stopped and searched several Palestinian cars. In related news, medical sources in Hebron said that a Palestinian child, identified as Yazan Zeidan Sharabaty, 13 years of age, was injured after being attacked by a number of fanatic Israeli settlers. His father told the Palestinian News & Info Agency (WAFA) that a number of settlers of the Beit Hadassah illegal settlement, installed on Palestinian lands, assaulted his son as he was heading to a nearby bakery. Following the attack, Israeli soldiers detained the father and his child, and moved them to a police station near Keryat Arba’ settlement in the city. The Police alleged the father and his child “attempted to attack settlers and soldiers”; the two were released later on, but had to sign an affidavit to go to court if ordered. Dozens of soldiers also invaded the Qabatia and Ejja towns, south of the northern West Bank city of Jenin, broke into and searched several homes. Palestinian security sources in Qabatia said that the army invaded the homes of Nasser Khuzaymiyya and his brother, Makhzoom, and interrogated them and their families. The sources added that the soldiers also invaded homes in Ejja town, and photographed their exterior and interior, before invading Jaba’ nearby town. Israeli settlers Saturday night severally beat up a 13-year-old Palestinian in central Hebron, according to the child’s father. The father told WAFA that settlers beat up Yazan al-Shirbati, 13, while he was passing near Beit Hadasa settlement, causing him several bruises throughout his body. He said that Israeli police arrested him and his son following the incident and detained them for five hours in Ja’bara police station where police accused them of trying to assault the settlers and other soldiers. They were later released after signing a pledge to appear before court if they were summoned. Dozens of ultra-Orthodox Jews hurled stones at cars traveling on route 1 highway in Jerusalem on Saturday evening, in what victims claimed were racially-motivated assaults targeting Palestinians. 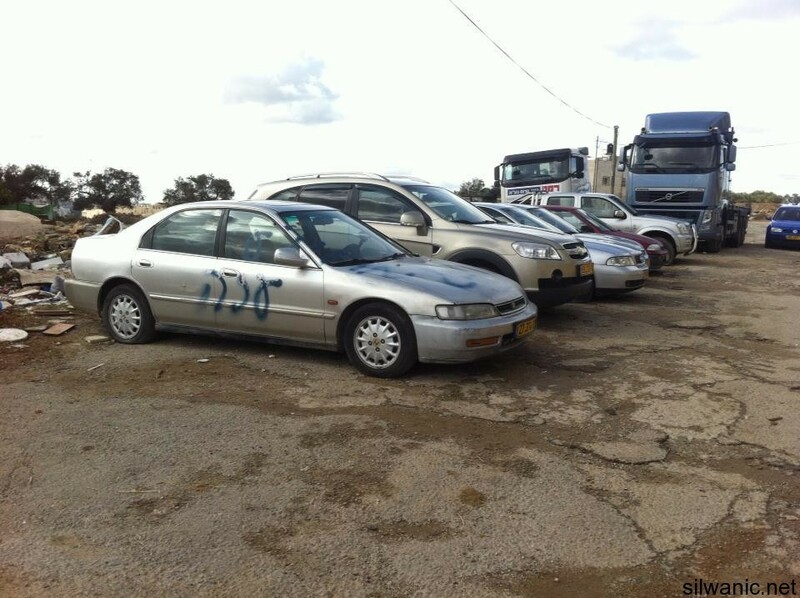 Eyewitnesses told a Ma'an reporter that about 60 ultra-Orthodox Jewish men hurled rocks at vehicles driven by Palestinians with Israeli registration plates and assaulted a bicyclist before stealing his bike. Muhammad Abu al-Hummus, a Palestinian Jerusalem resident whose vehicle was attacked, said that some of the attackers were hurling stones from balconies and windows while others were on the road itself. Abu al-Hummus added that when his car was hit, he stopped and stepped out, but attackers continued to pelt him with stones injuring his foot. 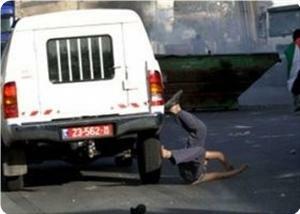 Abu al-Hummus confirmed that a bicyclist was attacked with stones and his bike was stolen. A group of Israeli troops and police horsemen arrived on the scene, Abu al-Hummus said, but they merely watched the assailants and did not intervene. Abu al-Hummus said that the police told the victims to file complaints at Israeli police stations. Israeli police spokesperson Micky Rosenfeld told Ma'an that he had no reports of the incident, possibly because no complaint had been received. There have been tensions in the past between ultra-Orthodox Jewish settlers in East Jerusalem and local Palestinian residents, specifically in the area of highway 1. In addition, ultra-Orthodox Jews often protest against vehicular traffic on Saturday as they deem it to violate Jewish proscriptions on working on the Sabbath. Jewish extremists attacked several Jerusalemites on Saturday night while passing in street number “1” in Jerusalem. Mohammad Abu Hummus, one of those affected, said that dozens of Jewish extremists threw stones at Arabian cars while passing in street number “1” in Jerusalem; note that some of them were throwing stones from their homes and others were standing in the street. 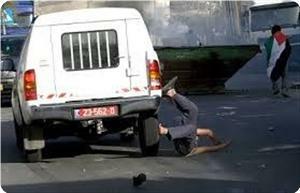 After a stone hit Mohammad’s car, he stopped and got out and was then hit with another stone in his leg. The extremists also threw stones at a young man riding his bike and then stole it from him. Several other Jerusalemites were terrified especially children after the stones were had directly hit their cars. He explained that the police individuals and borders police arrived at the area and told one of those affected to file a claim. Israeli settlers attacked Palestinian farmers and their families in the Wadi Abu al-Reesh area in the southern West Bank near Beit Ummar on Saturday evening, a local spokesperson said. Muhammad Ayyad Awad, a spokesman for Beit Ummar's local committee against settlement activities, told Ma'an that settlers wearing masks and white uniforms threw stones at farmers and swore at them both in Arabic and Hebrew. Awad highlighted that some of the attackers carried rifles. The farmers had to leave their fields immediately because many of them were accompanied by their children and they were worried for their safety, added Awad. 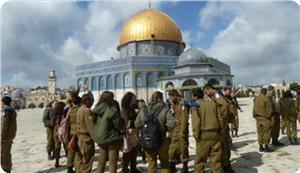 Israeli troops arrived, he said, to protect the attackers. The soldiers watched as settlers vandalized olive trees and instead of stopping them, the soldiers inspected the identity cards of the Palestinian farmers and prevented them from taking photos with their mobile phones. The mayor of Beit Ummar Nasri Sabarnah arrived along with officers from the Palestinian military liaison who documented the attack and received an official complaint from the mayor. The Israeli forces arrested on Saturday three Palestinian youths from Bab Al-Amud neighborhood in central Jerusalem, witnesses said. 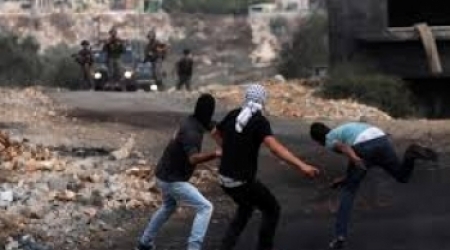 They told WAFA Israeli forces arrested three youths from Bab Al-Amud Following claims by settlers of attacking them. 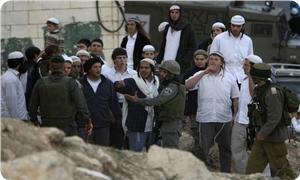 They were taken to a police station in Jerusalem. Israeli settlers torched Saturday a sit-in tent set up on the land of Nabi Samuil village to the northwest of Jerusalem to protest the Israeli taking over of the village land, a local activist said. Eid Barakat, a local activist, said that several Israeli settlers raided the village in the morning hours and torched tires inside the sit-in tent that was set up in protest of the confiscation of the village land as well to protest taking over of a mosque belonging to the village under the pretext of renovation. Barakat added that the villagers would continue their sit-in in order to convey to the world the message that they are being ethnically cleansed by the Israeli occupation forces, which seek to isolate and control the village which has a total resident population of almost 300 Palestinians. 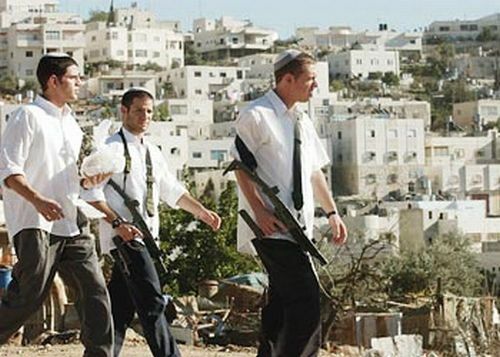 Israeli settlers from Karmiel and Beit Ayin settlements attacked Saturday several Palestinians, including four elderly men, in Um Al-Khair and Beit Ummar, located to the south and north of Hebron respectively, according to local activists. Ratib Jabour, Coordinator of the Popular Committee against the Wall and Settlements in southern Hebron, said that Israeli settlers from the illegal Karmiel settlement, under the protection of Israeli forces, attacked and severely beaten several shepherds from Um Al-Kair village, including Maliha Al-Hathlalin, 57, and Suleiman Al-Hathalin, 65, who fainted after being hit on the head. He was transferred to hospital for treatment. 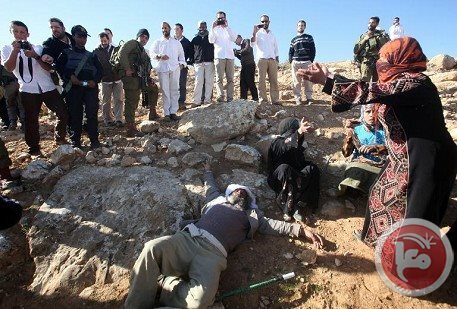 Meanwhile, Mohammad Awad, the Spokesperson of the Popular Committee against Settlement in Beit Ummar, said that Israeli armed settlers from the illegal Beit Ayin settlement, under the protection of Israeli forces, attacked, chased and prevented several Palestinian farmers, including two elderly men aged 80 and 70, from farming their land located in a nearby area. He added that settlers attack farmers in that area almost on daily basis as an attempt to drive them out of their land in order to take over the land for the benefit of settlement expansion. 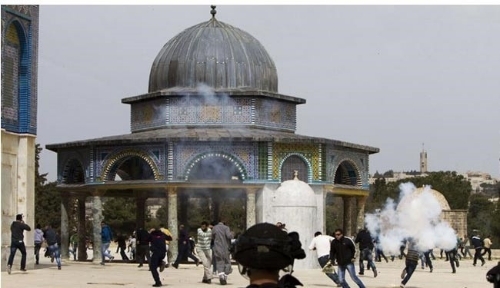 The Al-Aqsa foundation for Religious Endowments and Heritage, an NGO devoted to protecting the mosque from Israeli forces, has warned of the dangers posed by the Israeli excavations only meters from the complex. According to the NGO “the Israeli occupation aims to destroy Islamic sites in the area near the Al-Aqsa Mosque and Jerusalem's Old City." The new excavation is being funded by a right-wing Jewish pro-settlement organization and aims to make room for a new Jewish religious center. Palestinian rights organizations are being disallowed to inspect Israeli excavations on a regular basis. 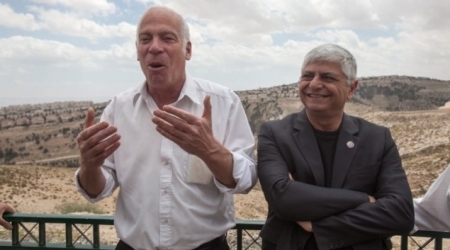 Zionist Minister of Housing and Construction Uri Ariel, a senior member of Israel's colonial government, has called for the rebuilding of the what he called (Third Temple) to replace al-Aqsa Mosque in Jerusalem. “The first Temple was destroyed in 586 BCE, the second Temple in 70 CE, and ever since the Jews have been mourning its loss,” he claimed. “Now that Israel has once again become a Jewish sovereign state, there have been occasional calls to rebuild the Temple,” he added. It is known that al-Aqsa Mosque (E: the Farthest Mosque) is considered the third-holiest site in Islam and the oldest name for the compound of Islamic religious buildings in Jerusalem that includes al-Aqsa congregation mosque and the Dome of the Rock. The term Al-Aqsa Mosque was coined in the Quran: Al-Aqsa Mosque is sacred because the first of the two Qiblas. In Islamic tradition, Al-Aqsa is said to be the second Masjid. The mosque is also the third of the two holy Sanctuaries. 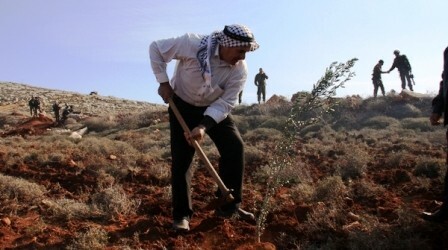 A group of Israeli settlers, on Wednesday, uprooted 800 olive saplings planted by Palestinian farmers, in the village of Sinjel. The trees had been donated by the International Committee of the Red Cross, as part of a project to restore hundreds of acres of Palestinian farmland that had previously been damaged by Israeli settlers. 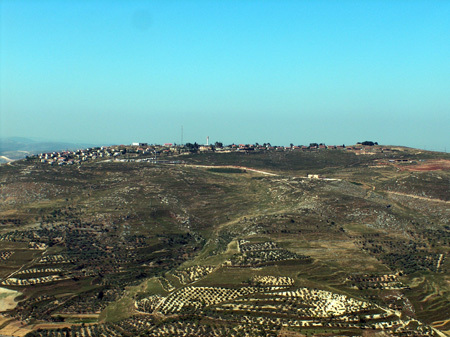 The mayor of the village of Sinjel, Ayoub Seedan, told reporters, Wednesday, that farmers from his village awoke that morning to find a group of Israeli settlers uprooting and stealing their olive tree saplings and, then, transporting them back to the illegal settlements of Givat Ariel and Maale Levona, located near the village. The settlements were constructed on illegally seized Palestinian land, and numerous incidents have been reported of destruction and theft of land and property by the settlers, who moved into the colonies in recent years. A Palestinian Authority official in charge of monitoring Israeli Settler activity, Ghassan Daghlas, told reporters from the Ma'an News Agency that his office had received a report of the theft of hundreds of olive trees, and filed an official complaint with the Israeli police. 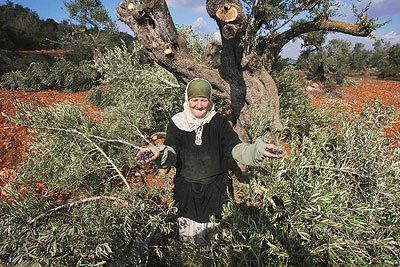 The olive saplings, which were donated to the villagers by international supporters, would have supported 70 Palestinian families, all of whom have had their main source of livelihood – their land – seized, damaged or uprooted by settlers in the recent past. Destruction of olive trees by Israeli settlers and soldiers is a common occurrence in the West Bank – close to one million olive trees have been destroyed or uprooted since the Israeli occupation of the Palestinian Territories began. Over 7,500 trees were destroyed in 2012 – the numbers for 2013 have not yet been released, but most estimates indicate that the number of trees destroyed in 2013 was even higher than in previous years. Israeli settlers uprooted on Thursday dozens of olive trees, planted several years ago, in Deir Estia village west of Salfit. 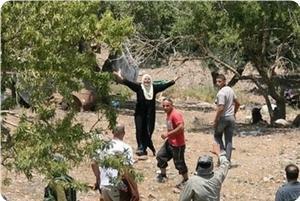 The settlers claimed that the olive trees were planted in an area designated as a “nature reserve”. The Israeli occupation forces have imposed restricted access to these lands, while Palestinian farmers came to protect their lands and re-plant what have been uprooted by the settlers. 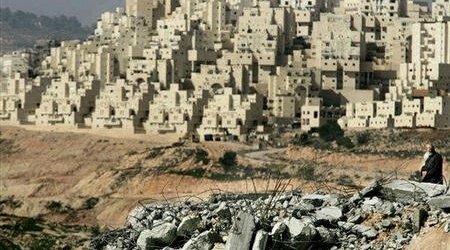 Israeli occupation authorities have established several settlements surrounding the area in an attempt to confiscate it. 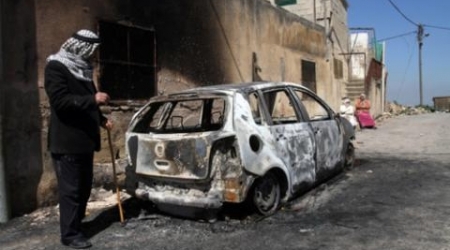 Meanwhile, violent clashes erupted in Beit Furik village east of Nablus on Wednesday when Israeli settlers stormed the village and attacked its Palestinian residents. According to PIC reporter, Israeli settlers had infiltrated the village where they stoned the residents' houses and set fire to the farmers' crops. Palestinian youths have tried to address and evict the settlers; however IOF soldiers arrived to the scene and fired rubber bullets and tear gas bombs at the youths. The forces stormed and searched a number of houses during the clashes, PIC correspondent added. Beit Furik village is daily subjected to many attacks carried out by Israeli settlers from Itamar settlement.